The recommended working distance is 276 mm to infinity, although good images can be obtained as close as 166 mm. 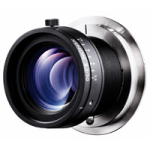 Contact us for optional lens mounts: Canon mount; V-mount; M42 mount; and M58 mount. Good images can be obtained with working distances as short as 166 mm. Canon mount, V-mount, M42 mount and M58 mount also available.